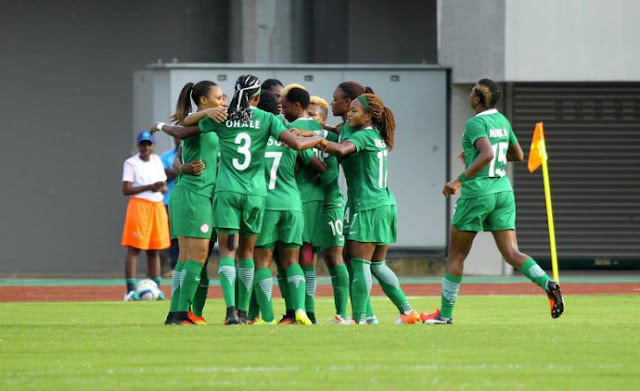 The Nigeria Football Federation has made a pledge to pay players and officials of the Senior Women National Team, Super Falcons all their entitlements for winning the Women Africa Cup of Nations for the eighth time, even as it craved the understanding of the team that the money is not readily available at the moment. NFF General Secretary, Dr. Mohammed Sanusi, who met with the players and officials at the Agura Hotel on Tuesday, said the Federation is not happy owing players and coaches, but present severe economic challenges inform that it can only continue to seek the understanding of these persons, as well as hoteliers, travel agents and Management and Staff until the situation improves. “There is no gainsaying that there is severe economic challenges and all organizations, whether government or private, are feeling the pinch. It is not Government’s doing; it is not anybody’s doing. We know we have financial commitment to you (players and officials of Super Falcons) and we have not at anytime stated otherwise. But the money is not readily available at the moment. Sanusi also recalled that the Super Eagles were owed monies for the match against Tanzania and were paid when funds for that match was made available by Government. “As I speak with you, we are still owing the Super Eagles for the matches against Zambia and Algeria, but the memos have gone to Government and are being looked at. Stating that the NFF has embarked on aggressive drive to find a permanent solution to the issue of owing players and coaches, Sanusi said corporate players are now lending a listening ear to the NFF leadership and the Federation’s finances would soon improve. “We are also working to get monies outstanding from former sponsors of the National Teams, to complement what we are expecting from Government. The NFF scribe also appealed to media representatives to understand the plight of the Federation, and temper their write –ups with some understanding. “This morning, I was reading a report that the Federation is yet to pay the Super Falcons one kobo. That is not correct. While the team was in Cameroon, the NFF sourced for money from one of our sponsors and paid the players N500,000 each, and also paid the technical crew and backroom staff. While praising the Falcons for their tenacity and total dedication to duty in Cameroon despite low morale, Sanusi confirmed that the NFF is waiting for word from the Government to know when the African champions will be hosted to a state reception. “The reception is out of our hands. We are waiting on the Federal Government, and as soon as we have confirmation of the date, we will inform the players and officials to regroup in Abuja.